On the eve of the magical Tenerife International Film Music Festival, we interviewed the founder and director of this popular event, Diego Navarro. Think extravaganza, great music and outstanding musicians and voices, think of vivid colours, amazing content, images and wonderful sounds in perfect harmony, think of showmanship; All that and more in the concerts and related events during Fimucité between July 5 and 14. We met Diego in a room filled with an imposing array of monitors of all shapes and sizes, computers, keyboards and cables in his home town of Santa Cruz de Tenerife. The youngest of four siblings, Diego came from a musical (although not professionally so) family and was fascinated from an early age with the connection between images and music. Travelling to and from school he would listen to film music in his head and he eventually decided to put his musical talent to use by dedicating his life to writing sound tracks for the cinema as his “ideal” career. A child prodigy, creating music “intuitively”, aged 13 he performed a self-composition for the first time in front of an audience and conducted his first orchestra when he was just 21. He studied piano with David Goldsmith in Puerto de la Cruz, a man whom he describes as “an authentic maestro” who most inspired him amongst all the teachers with whom he has had the honour to study. In his private music listening time he switches between three fields: classical, some cinema music “curiously very little because when I listen to music it is to disconnect and when I listen to cinema music I’m analysing and dissecting not relaxing” and jazz. 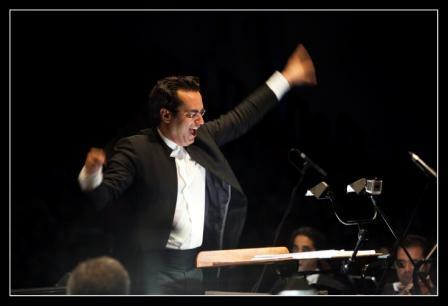 The Tenerife Film Orchestra and Choir, the first private orchestra dedicated to playing cinema music in Europe, was formed in 2005, but had its roots in Diego’s first commission to compose music for a full feature film at the end of 2001, Time gate, which was nominated for a Goya. Diego suggested that it be recorded in Tenerife and he took over from there, hiring musicians and technicians, and organising venues etc. It was an enormous challenge; the first time the music for a full length film had been taped in the Islands. However it was a huge success and put his name in the frame as a composer of film music. From that seed came the idea for the TFO & Choir which evolved in 2007 into the international film festival, Fimucité, and Diego has always fought to have the music he writes recorded in Tenerife and will continue to do so. From small beginnings, Fimucité, despite having less funds each year, continues growing in content, quality and popularity and is considered as one of the best of its genre in the world. They are proud to have as ‘in house’ musicians for the festival, the Orquesta Sinfónica de Tenerife, one of the best professional orchestras in Spain. Every year people travel from all over the globe (as far away as Melbourne, Australia and New York) and organise their summer holidays to be part of the event. It is so highly considered that the cinema giant, Universal, chose this festival to celebrate its only 100th anniversary concert last year. “That this should happen in only our sixth edition shows how prestigious the event is”. To choose the topics each year, they try and tie it in with anniversaries of films, studios, composers etc. For example this year, in their 7th edition, they are presenting music from the films of perhaps the most celebrated ‘7’ in film history 007 – James Bond – and the 50th anniversary of the opening night of the first Bond film. Other celebrations this year include the first tribute worldwide to the music of the Dreamworks Animation studio (Shrek, Kung-Fun Panda, Chicken Run …) and the 35th anniversary tribute to the Varèse Sarabande recording label, the most important recording company in the world in cinema music. The last music released by this company included music by Diego. They will also be playing the music of their invited guests this year, David Arnold (Independence Day, Stargate, Godzilla, Casino Royale …), Marco Beltrami (Hellboy, Resident Evil …) and Alfonso de Vilallonga’s Oscar nominated Blancanieves. Non-OST concerts this year include The Canarian Big Band in the Teatro Guimera, dedicated to the works of Elmer Bernstein (The Magnificent Seven, To Kill a Mockingbird, Ghostbusters), and timplist Beselch will be performing film music on that most Canarian of instruments in the University of La Laguna main hall. Diego has now internationalised the festival. He has been a guest conductor at the Krakow Film Festival for three years so far and has recently conducted at a “super spectacular” Varèse anniversary event in the Warner Bros theatre in Los Angeles, sharing the podium with some of the legendary great composers, and received a standing ovation in front of all the most important names of the Hollywood musical industry. “It was a great forum for me personally as an artist and composer and for Fimucité which was billed there as ‘the incredible Tenerife music film festival’”.